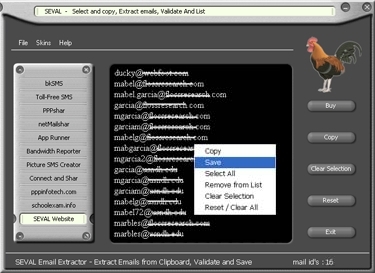 Collect, Copy and Save email addresses from multiple sources.SEVAL email extractor grabs all email addresses from windows clipboard.Copy any text in part or full from virtually any document - you can copy from HTML/webpages, Excel worksheet, Word document, pdf document.When SEVAL email extractor is running, open any document, mark a part or select in full and copy to clipboard. SEVAL software gets activated and just extracts the email addresses, validates them, removes duplicates and lists all email addresses on the screen.Option to save the extracted/grabbed email address in various formats. You can save as Excel file, Word document or simply in a text file.Email count: Displays in realtime the number of email addresses extracted.Option to remove one or more email addresses from the extracted list of emails.Right click context menu to Save, Remove selected email ids.Runs minimized in system tray. This free utility allows you to save categories from the Outlook Master Category List to a text file in XML format. After you save this file, you can edit it in any text editor, even Windows Notepad. Mailing List Express is a must-have marketing tool, whatever line of business you`re in. It lets you fire out personalized e-mail shots to existing and prospective customers and is ideal for sending out newsletters and ezines.